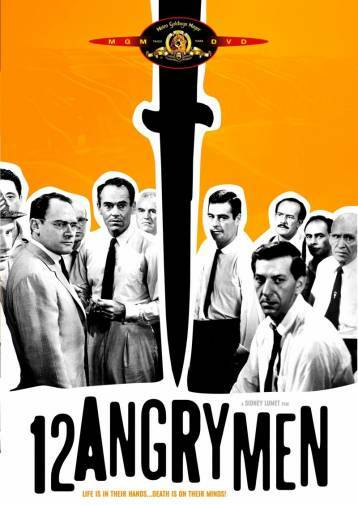 ’12 Angry Men’ (1957) is based on the premise of reasonable doubt within an adversarial system. This means that it is the responsibility of the prosecution to prove its proposition to the extent that there is no reasonable doubt in the mind of a reasonable person that the defendant is guilty. Almost the entire film, with an exception of 8 minutes takes place in the jury room, where 12 people decide the fate of a 18 year old boy charged with the murder of his father. Outside the jury room, we briefly see the exterior of the New York Court, the lobby, the courtroom and an adjoining wash room. We see the 18 year old boy only once as the jury leaves the court room towards the jury room. We never see the victim or his body or the witnesses or the lawyers. We see the judge once as he hands over the case to the jury, impertinent in the way he leans his face on his arm, and with his lazy drawl he makes it clear that he himself does not think much of the case or the fact that if found guilty, it means the electric chair for the boy. In India, the jury trials system was abolished in 1960 after the famous Nanavati case. Even so, and even after 63 years the film has not lost its relevance. Certainly today a jury would be more mixed, here it comprises only of white men. It is also possible that in today’s age of political correctness, jurors would be careful about voicing their prejudices so openly. But the 12 men represent different kinds of attitudes we have towards any problem. Sometimes we are timid, and we find it difficult to voice our opinions. That becomes a habit until we never even formulate our opinions to ourselves. Sometimes we let our personal emotions obscure the truth. Sometimes we are too sure we know best. Sometimes we are lazy, and sometimes we just could not be bothered to be involved. Sometimes we look for attention and sometimes we are used to being ambivalent about everything, going with the flow. But what makes this film special is its belief that one person can change the opinion of the majority even in the face of opposition and ridicule, if they speak up. It celebrates the power of words and clear-headed thinking. Reginald Rose was a well known TV actor and playwright. He wrote this as a television drama after an experience serving on a jury. The show did very well, and therefore most producers were skeptical about making it into a movie. Finally Henry Fonda decided to produce it himself with Reginald Rose. Most of the cast were veteran theatre actors. Sidney Lumet himself had acted and directed theatre and TV, before he was offered this film by Henry Fonda. I think it is this background of theatre and the fact that they rehearsed the film like a play for over a month, that helped the director and the actors to create an enthralling drama within a small room. Lumet said that he decided to accept that it was never going to be anything other than 12 men in a room, and so made the most of it with camera movement and angles. And in fact, that becomes the film’s strength. It does not remain a theatrical piece on a set, but becomes cinematic, as the camera explores the room and the characters with dynamic tracking shots and angles. Lumet points out that the film, for instance, first mainly takes top angles, then it comes to eye level, and then goes to low angles by the end of the film. On a second viewing, you realize the subtle change in camera angles, that comes with some turning point in the film. Lumet and the cameraman, Boris Kaufman, create a sense of passing time through a hot summer day. The oppressive heat and bright daylight as the jury sits, then an impending storm and rainfall, and then darkness outside, necessitating lights coming on within the room. The non-functioning fan too plays a role in creating a sense of time, of an increasingly oppressive heat as tempers fly. When the fan finally begins to work, it also gives the jurors a new impetus to keep talking. The film unfolds entirely through talk. Action is almost limited to wiping sweat off faces and putting on and removing coats, except for a couple of dramatic moments with a knife, and a blueprint of the witness’ house. It is through the dialogue that sharp and well-defined portraits emerge of each of the jurors, the defendant and the witnesses. Only 2 characters introduce themselves at the end of the film, otherwise we never learn the names of any of the other characters. Their backgrounds are created minimally with passing references to their lives outside the jury room, one is a salesman selling marmalade, one a watchmaker proud to be an American citizen, a timid bank clerk who had a fight with a colleague last week, a belligerent father who hasn’t seen his son in 2 years. The world outside too comes alive through their words, a baseball game that night, a baseball game at school, and above all, the slums beside the railway tracks, where the defendant boy grew up. Music is used minimally, only at the defining moments of the film, when decisions are made. he has the same dignity and a thoughtfulness on his face, which perhaps led to his playing certain kinds of characters. Here, he plays Juror #8 with minimal fuss. We learn that he is an architect in a scene in the washroom, where confronted by the salesman, he goes about washing his face and hands. As he wipes his face and hands carefully, and then starts cleaning under his nails, while the other blusters on, you realize he is a meticulous person, not prone to making hasty judgements. It’s a wonderful piece of acting, very understated. This is what works in the film, the fact that all the people, including the architect played by Henry Fonda, are ordinary people, they are not heroes. The cinematography, editing, music, sound design though brilliant are not obtrusive or gimmicky. The film like the clarity of thought that it celebrates, is clean and sharp in its execution. It’s hard to believe that a film confined to a room can be classified as a thriller, but a thriller it is. Nice! i need to seek this out, as your review makes me want to watch it. Yes, do. It’s worth it. Ever since, I’ve been wanting to see 12 Angry Men. About time, I think, now. I saw ’12 Angry Men’ like Sabrina, twice in one go. I was that impressed. If I was a teacher, I’d definitely show this film to students as a lesson in mise-en-scene, dialogue and narrative. I don’t remember ‘Ek Ruka Hua Faisla’ at all, except Pankaj Kapoor pacing up and down. Just bumped into your blog somehow and I love “12 Angry men” , so the comment. I remember it being given as a case study about human psychology for some course in my husband’s business school. Yes, I think it’s very good study material. Amazing how precisely designed this film is. The camerawork is a good example — Lumet talks about it in his wonderful book, Making Movies. The other thing I noticed was the sound — how the background noise is turned up and down according to a certain plan. Even if one ignores the technique, it is still very affecting. Some scenes are amazingly well done — the one where one of the jurors goes on a racist rant and everyone slowly turns away from him in disgust never fails to get to me. Yes, the beauty of it is however, that none of the technique is overpowering, and does not seem deliberate, which could have easily happened. It is integral to the story-telling and therefore the film holds you in its grasp without hammering technique or ideology at you. 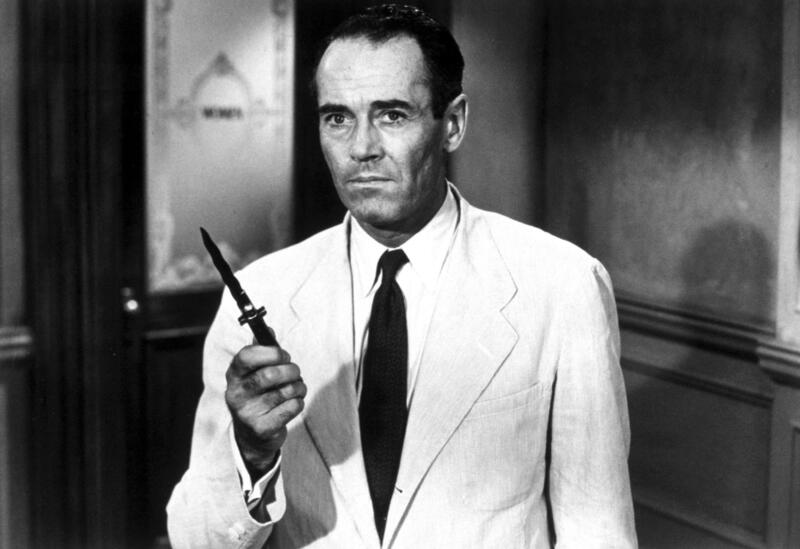 I haven’t seen too many Henry Fonda movies but I did enjoy 12 Angry Men. It’s interesting that you compare him to Balraj Sahni. I was on an airplane once and the passenger next to me, in the course of our long transatlantic flight, asked me to pick a list of ten people, living or dead, that I would like to have over for dinner. I didn’t think Pat the Irishman would have known him but Balraj Sahni would have been one of those ten. He seems like someone who would have had much to share in conversation. How about you, Batul? If you could invite 10 people, living or dead, over for dinner, who would they be? And what would you serve them? Balraj Sahni, definitely. I used to like him even when I was a child, and probably didn’t understand much about performances. But after I read his autobiography in Hindi, I was even more impressed with him. Yes, he’d certainly have a lot to talk about. As for the list of 10 people, hmmm, material for a post, what say? Bollyviewer, must see Ek Ruka Hua Faisla again, to make any meaningful comparison. But this one is definitely worth watching several times. I remember watching Ek Ruka Hua Faisla long ago. Now I need to watch 12 Angry men. 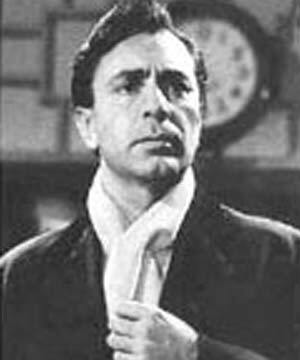 Balraj Sahni had tremendous dignity and charm. 12 Angry men is a favourite of mine, that I’ve had my engineering students study time and time again, so I know the movie by heart, almost! A question for you: what makes these 12 men “angry”, would you say? Yves, Your question has had me thinking for days. But I have no articulate answer to it, beyond the superficial of their stances. I guess I don’t know the film as well as you do. What do you say? So perhaps there is another meaning to the word “angry”? Could it be that they’re (objectively) rebellious against a system of justice which doesn’t train them to render real justice, and lets them behave as if a man’s life was unimportant?… This isn’t a very good proposition, but I can’t think of anything else. Yves, I didn’t really see them as rebellious against a system of justice. They took it for granted that they had a right to judge over a man’s life. But yes, most of them, except Henry Fonda, did have a tendency to judge according to preconceived notions about the boy, and where he came from. Could that be the ‘angry’? And the boy himself, the other side of that ‘angry’? A must watch film for those who want to study something,speak something. The most reasonable film human thought produced.